Merriam-Webster Dictionary defines “opportunity” as a favorable juncture of circumstances, or a good chance for advancement or progress. To me, Opportunity’s legacy embodies the name she was given. This rover, along with its twin – Spirit – not only gave us a better understanding of the Martian landscape and its history of water, but significantly improved our knowledge about how to navigate on other planets – something that will help future robotic and human exploration of Mars. Opportunity can arise when we least expect it, or it can be a product of hard work and preparation. In the case of the Mars Exploration Rovers, it’s both. 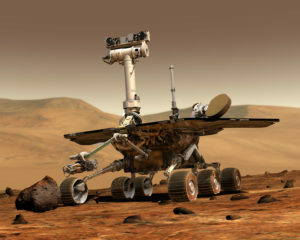 NASA’s robot geologist duo, Spirit and Opportunity, landed on the Red Planet in 2004 with the goal of searching for clues of ancient water activity on Mars. While the missions were prepared down to the very last detail, the unexpected opportunity arose when both rovers exceeded their planned 90-day mission lifetimes by many years. Spirit lasted 20 times longer than its original design and sent its final communication to Earth on March 22, 2010. Twenty times longer! That’s incredible. Even more impressive is that Opportunity continued to operate for more than 14 years after landing on the Red Planet. Eventually, all missions operations come to an end and their legacy is used as a foundation for future missions of exploration. As we reflect onOpportunity’s legacy, I’m reminded of my fondest memory of its mission – its first encounter with Mars. I was a professor at the time and was so excited about the incredible feat humanity was about to attempt: bounce onto the Martian surface with the rover inside a landing craft protected by airbags. The week before landing, I showed my class an amazing animation of the intense landing that was ahead. I wanted them to realize how difficult this endeavor actually was. The night of landing I was alone in my living room with a laptop watching the NASA livestream of the Space Flight Operations Facility. You could there was an eerie silence in the room – each person waiting, listening, hoping. You could almost feel their energy through the screen, and then…confirmation! The room busted at the seams with joy and tears of happiness and relief. Humanity just accomplished a nearly impossible feat and I am so thankful I was able to witness it in real time. Last night, the team made their final attempt to contact the rover. I was in the room when the command was sent – this time felt much different than the last. 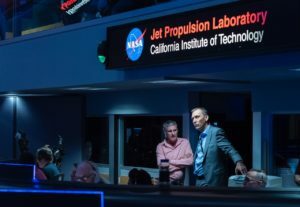 There was a heavy feeling in the air, which was filled with many team members, some of which have spent a majority of their careers assisting this rover as it explored a planet more than 33 million miles away. The humans behind the robot. Secretly we were all wishing that Opportunity would suddenly wake up and ping us back. That did not happen, as we all expected. 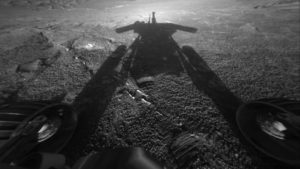 Farewell, Oppy. Thank you for all the science.